She is survived by her children, Harlan (Phyllis), St. Olaf, Gary (Nancy), Elkader and Marlene, Cedar Rapids; one daughter-in-law, Joyce (Dave) Caldwell of Ft. Dodge; 15 grandchildren; 26 great grandchildren, and six great-great grandchildren. 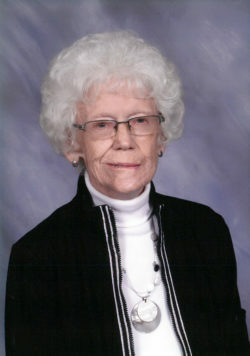 Arleen was preceded in death by her parents; her husband; infant son,Bradley Lee and son, William Frederick; two sisters, Dorothy and husband William Schmidt, and Leah “June” and her husband Loraine “Larry” Horstman; two brothers, Clifford and wife Catherine Nelson, Leighton and wife Yvonne Nelson. Visitation: 9:00 AM – 11:00 AM – Saturday, January 26, 2019, at Hope Lutheran Church, Littleport, Iowa. Funeral Services: 11:00 AM – Saturday, January 26, 2019, at Hope Lutheran Church, Littleport, with Rev. Margaret Yackel-Juleen Officiating. Interment: Union Cemetery, Littleport, Iowa.